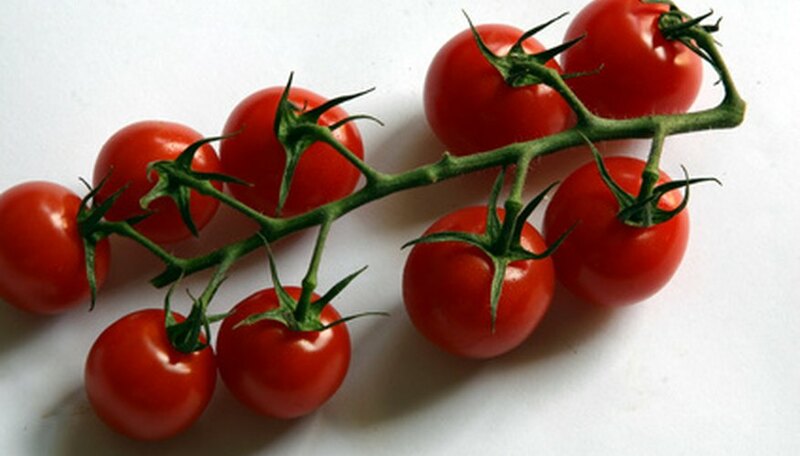 Tomato plants do not only grow in the summer, but also can produce fruit indoors in the winter. These fruits will be smaller than their outdoor counterparts, but will still pack a tasty punch, good for salads and snacks. Container-grown tomatoes require little extra care than outdoor tomatoes. Knowledge of how to grow these tomatoes and keep them healthy will help you produce fresh, tasty fruits in the dead of the winter. Fill a seed flat or small pots with a mix of half peat and half perlite. Plant the tomato seeds 1/4 inch into the soil. Tamp the soil down and water deeply. Keep the potting medium moist, but not soaked, until the seeds germinate in about five to 10 days. Transplant the tomatoes when they reach 3 inches tall. Fill 6-inch pots with a good quality potting soil and plant one seedling in each pot. Water deeply after planting. Place in a south-facing window for optimum light and warmth. Put a tray filled with rocks underneath the tomato plant and fill it with water. This will provide needed humidity for the plants during the dry winter months. Water the tomatoes deeply, allowing the top of the soil to dry out slightly between waterings. Fertilize with a water-soluble fertilizer marked 20-20-20 or 10-10-10 once every two weeks with the recommended dosage. Depending on the brand, the dosage will differ. Rotate the plants, making sure that each side receives equal amounts of sunlight. Provide supplemental light for the tomatoes in the form of a combination warm/cool fluorescent fixture during daylight hours and into the evening. Without the extra light the tomatoes will grow tall and spindly and fail to produce fruit. Tap the stems with your finger when the plant blooms. This will help the plant pollinate the flowers and produce more fruit. Purchase varieties such as Tiny Tim, Patio, Toy Boy, Small Fry and Pixie for best results. Although you will grow small plants, they still may need staking.